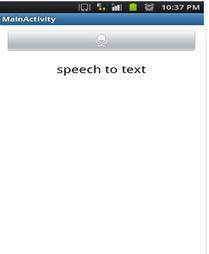 We will learn the steps to come with a process so as to convert the Speech into a Text in the text view for the Android devices. With the help of this article, we will learn how we can convert speech to a textual sentence in Android making use of API. There is a very attractive feature that Android has which lot of developers have not able to uncover yet which is the ability of the android application that makes use of the speech to text conversion feature very creatively. We all know that there is no replacement of voice commands in today’s world and we have Android providing the attribute that converts Speech into a text thereby making us to go this way. 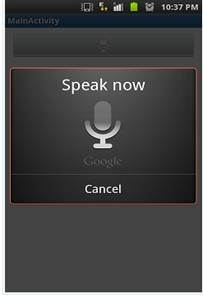 Let us see how we can convert Android’s Speech to Text API in a specific Android application. 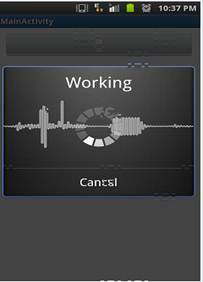 We will have a very simple application where in there will be a button with a Mic symbol. Accessing the button there will be a trigger of Android’s Speech to Text intent that displays a dialog so as to take input as a speech which is then converted into a text you will be then able to see the text being displayed in a text view. Let us proceed step by step to reach to the final outcome. Making use of the Eclipse, we will be creating a Hello World Android project by navigating to New>Project>Android Project and give any name to the project say “Speech ToTextDemo”. Now select Android Runtime 2.1 or sdk 7. Once completed with this step, we will have a hello world Android application ready in place. We will require a simple layout for our sample or demo purpose that will consist of an image button so as to trigger Speech to a text and then there will be a TextView where our results will be displayed which is converted from a speech. Now the next step would be to open layout/main.xml in the android project and its content needs to be replaced with the below code. Replace the code with the below mentioned. The Speech’s to Text Android API core is the package namely android.speech and exclusively class android.speech.RecognizerIntent. Normally there is an intent android.speech.RecognizerIntent being triggered that displays dialog box so as to identify speech input. Post this, the speech is converted into a text and then results are send back to the calling Activity. One must make use of startActivityForResult() once we invoke android.speech.RecognizerIntent intent for the reason that there is a need to listen back for result text. The important thing to note here is the way we create android.speech.RecognizerIntent and trigger it and then the addition of one extra parameter using .putExtra() method. Here we have just set the text that is obtained in the result in text view making use of txtText and utilizing txtText.setText(). We will have an exception ActivityNotFound being thrown at the time of initiation of an activity by the devices in case we have devices/android version that doesn’t support speech to text API. 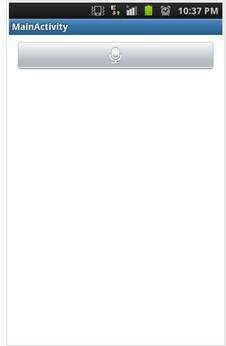 For the purpose of this tutorial, we have catched this exception and now a message will be displayed saying as “Opps! Your device doesn’t support Speech to Text”.